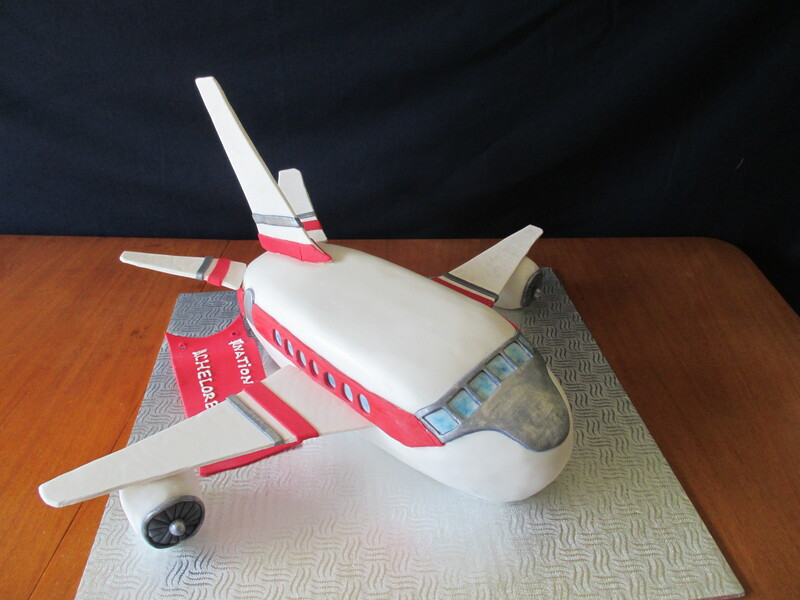 A special 60th Anniversary cake last weekend. A White tiered cake with a Lemon Cream Filling and frosted entirely with a Swiss Butter-cream all in pretty roses large and small. Glistening Gumpaste Snowflakes because they were married so close to Christmas… My mother’s father dropped their wedding cake (Oooops! 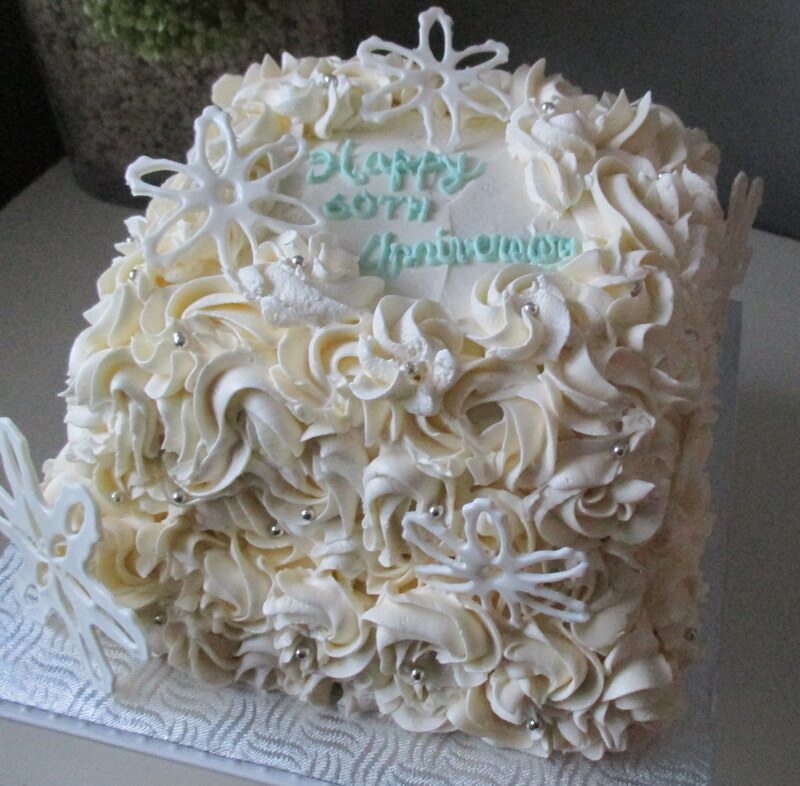 ), so I thought I would make them a special one for their 60th. 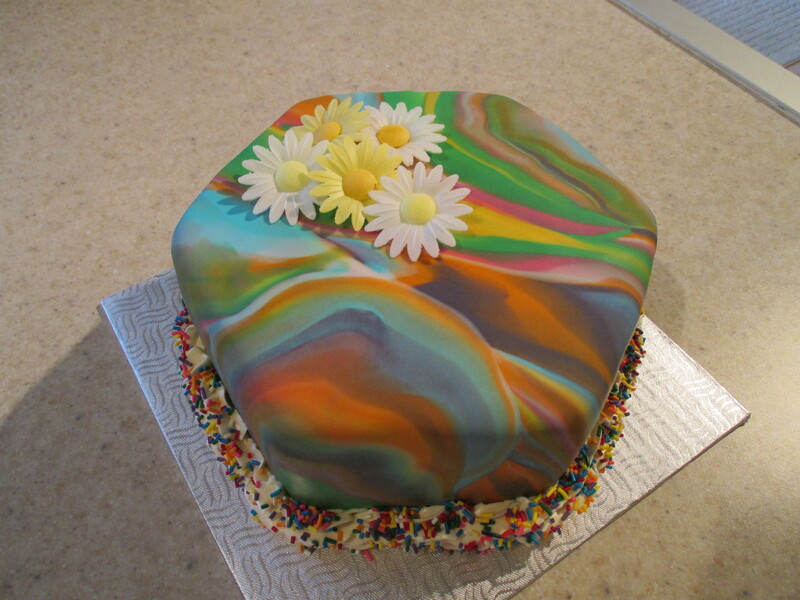 In celebration of a 70th birthday, Village Sweets made a “70” Birthday Cake. 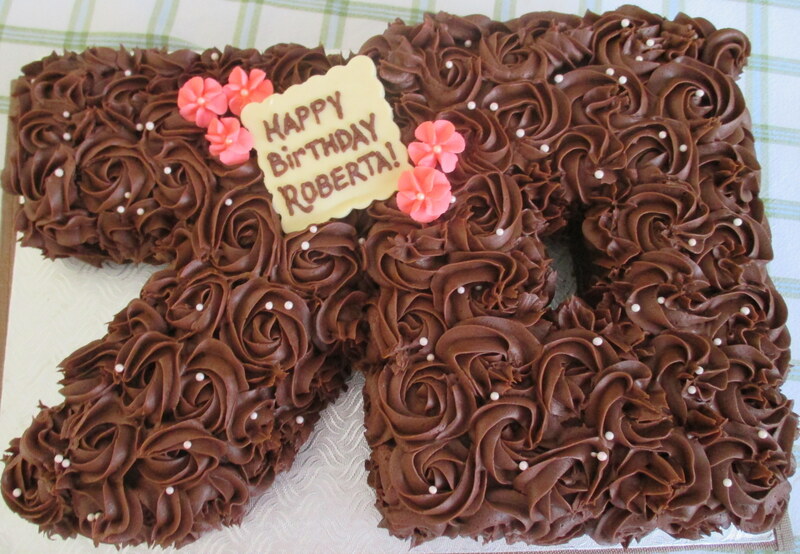 One of the cakes, vanilla flavored with an orange cream filling, the other a chocolate cake also filled with an orange cream and both were topped off with big round chocolate roses frosting… Happy Birthday Roberta! 1. Gâteau au Vanille avec une Crème Mocha, enrobé d’une glaçage au Chocolat (photo). / Vanilla Cake with a Mocha Cream Filling, Frosted in Chocolate with Chocolate Bark Shavings (pictured). $48.00 (12 morceaux / 12 servings). 2. 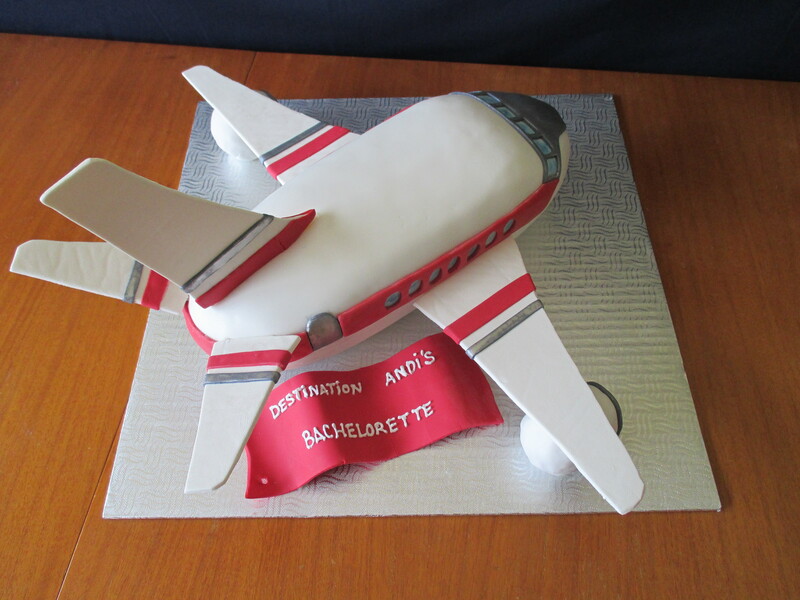 Gâteau au Vanille avec une Crème Framboise, enrobé d’une glaçage à la Vanille avec du Chocolat Blanc (photo). / Vanilla Cake with a Raspberry Cream Filling, Frosted in a Vanilla Buttercream with shards of White Chocolate (pictured). $48.00 (12 morceaux 12 servings). 1. Bûche “Automne Épicée”, Crème Glacée au Chocolat, Sorbet Poires Épicée, Gâteau aux Épices, décorer avec bâton de canelle, Gâteau enrobé avec une glaçge au Chocolat. / “Spiced Autumn” Log, Chocolate Ice Cream with a Glazing of Chocolate, filled with Spicy Pear Sorbet and a layer of Spicy Sponge Cake, decroated with Cinnamon Sticks. 2. La Bûche “Fruits Rouge”, Glaçe au Yoghurt Marbrée de Fruits Rouge avec une Mousse Glacée au Cassis, Gâteau au Framboise, décorer avec Macarons Rose + Vert et Pistaches. / “Red Fruit” Log, Raspberry Sponge Cake with a Frozen Blackcurrant Mousse, Marbled Yogurt Ice Cream with Red Fruit, decorated with Pink and Green Macarons and Pistachios. 3. 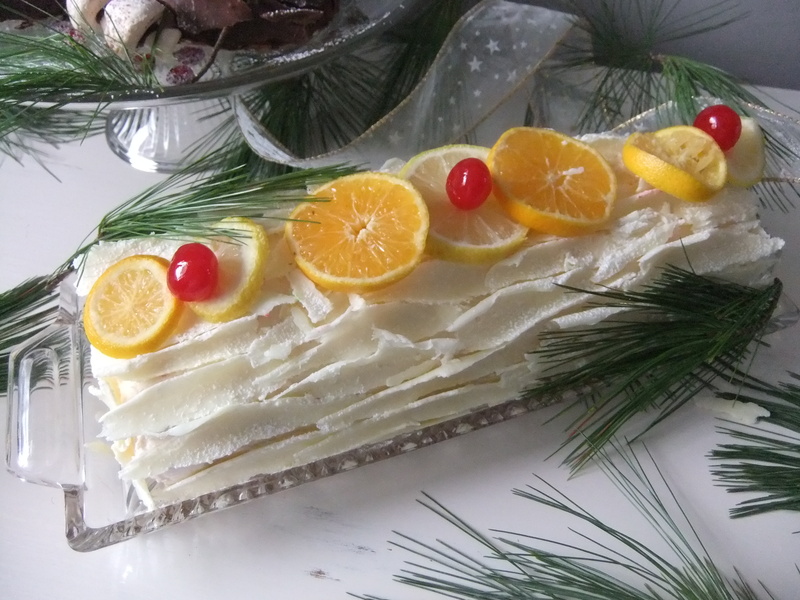 Bûche “Citron”, Crème Glacée Citron, un Coulis à la Framboise, Meringue aux Amandes, Pâté Sablée aux Amandes, décorer avec Meringue aux Amandes et Framboises. / “Lemon” Log, Shortbread cookie layer, Lemon Ice Cream and a Raspberry Coulis center, decorated with Almond Meringue and Raspberries. 4. Bûche “Café”, Dacquoise aux Éclats de Chocolat, Crème Glacée aux Café, Parfait Chocolat, Glaçage Noir, décorer avec du Chantilly Vanille, Macaron au Chocolat et des Fils Chocolat. / “Coffee” Log, Chocolate Sponge Cake, Filled with a Coffee Ice Cream and Chocolate Parfait, a Dark Glaze covering and decorated with Vanilla Chantilly Swirls, Chocolate Macarons and Chocolate Ribbons. Les Bûches seront disponibles pour une temp limité. Dernière date pour commander et le 22 Décembre, 2015. The Yule Logs will be available for a limited time. Last day for ordering is December 22, 2015. !! Joyeuses Fêtes !! !! HaPpY HoLiDaYs !! 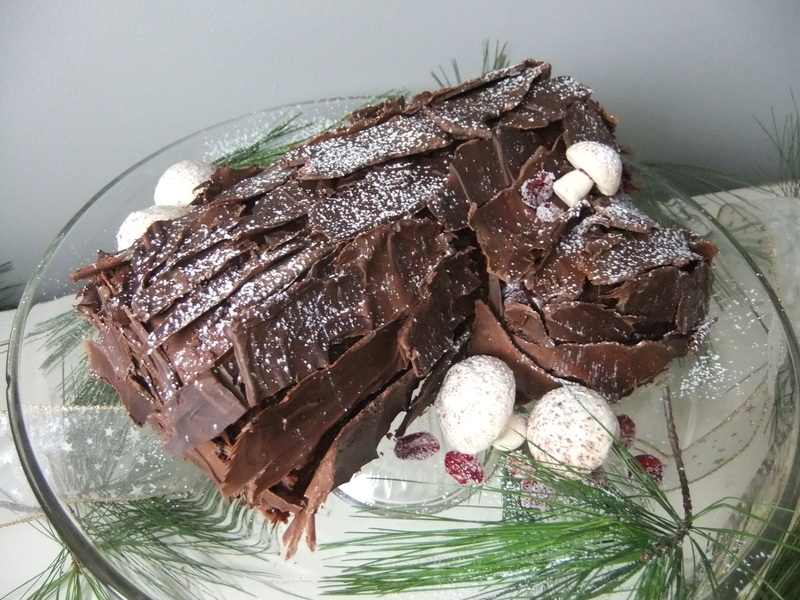 Vanilla White Chocolate with Raspberry Cream Yule Log. Vanilla with Chocolate Butter cream & Mocha Cream Filled Yule Log. Love doing Theme Cakes !! 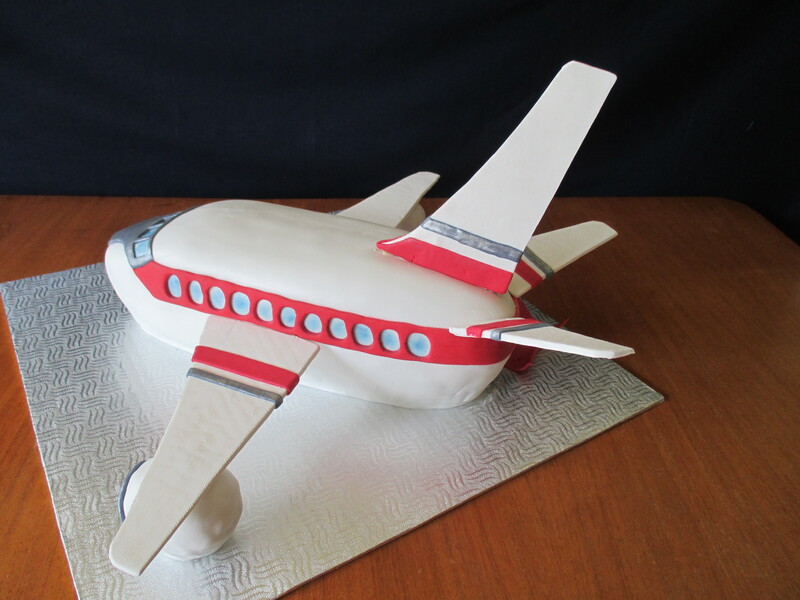 Village Sweets created their first “Make-Up” cake… woohoooo! First the cake, a vanilla cake with a Dulce de Leche filling plus a whipped cream filling and I frosted the cake with a smooth Vanilla Butter Cream frosting and topped it all off with a Pretty Pink Fondant covering. A quilted look with silver Dragées just made it gorgeous, some gum paste make up accessories and voilà this cake was ready to get eaten! 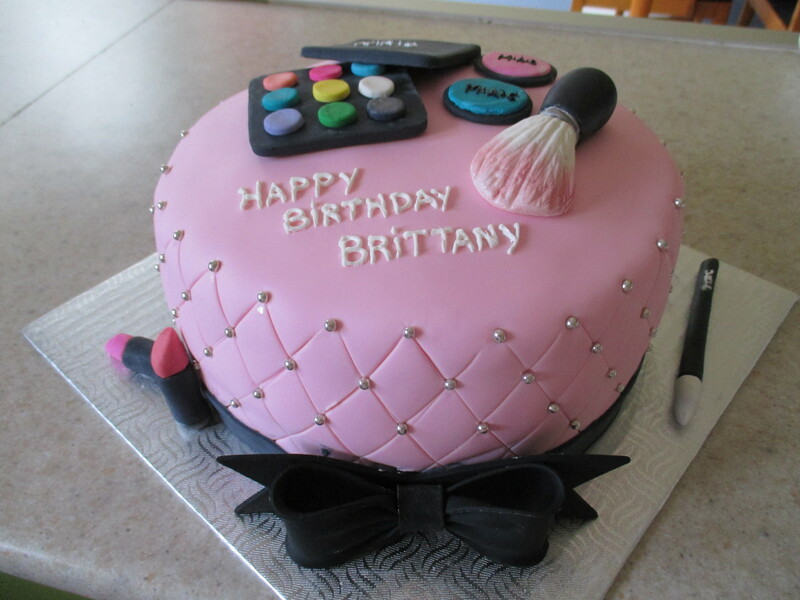 Pretty in Pink Make-Up Cake. 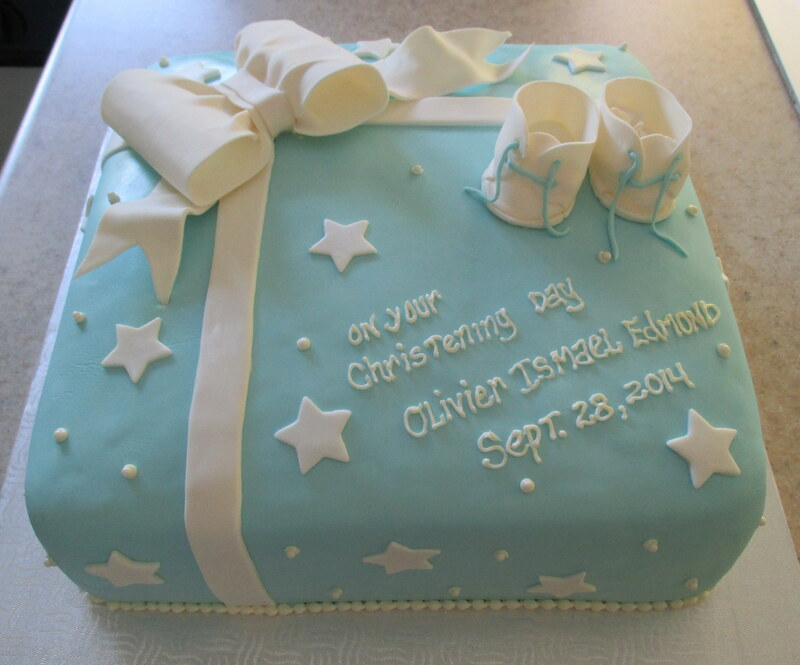 A Blue Christening cake for Olivier Ismael Edmond for his special day! Village Sweets baked a 4 layer White Cake filled with Mocha Cream and is frosted in our delicious Swiss Butter-cream Icing and covered in a blue Fondant. Enjoy your wonderful day and thank you for choosing Village Sweets ! White Cake with a Mocha Cream Filling Frosted in a Vanilla Swiss Buttercream and covered in Blue Fondant. (Thanx to Craftsy! The Perfect Cupcake with Jennifer Shea of Trophy Cupcakes). It’s been a while since my last post. 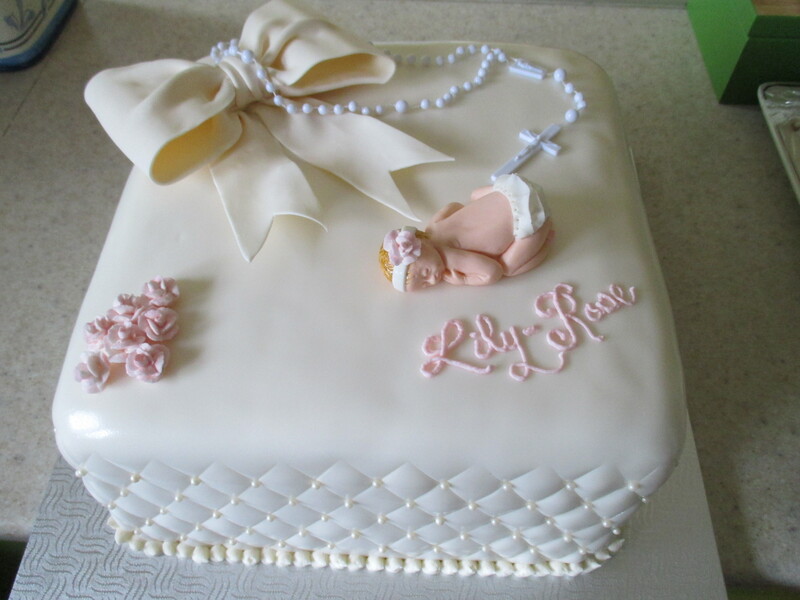 Village Sweets created a Baptism Cake for a cutie pie “Lily-Rose”. I made some Royal Icing Roses and painted them a soft iridescent Pink, roses to go with her name… Gumpaste Bow and a Gumpaste Baby, I even added a cute ruffled diaper. 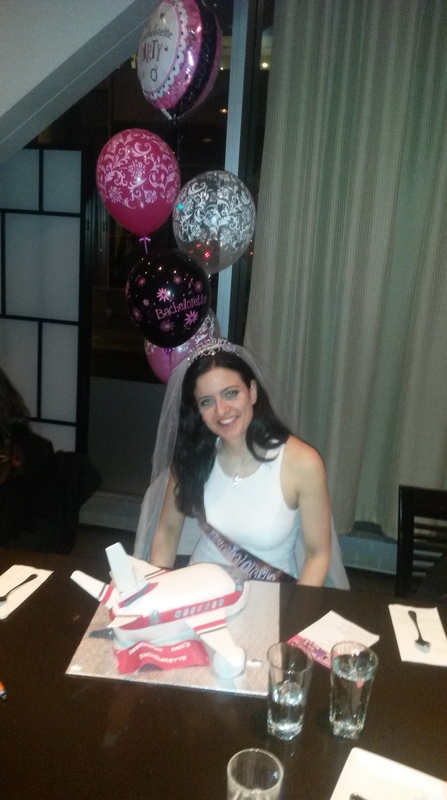 I draped a rosary across the cake as well. Vanilla Cake and a Swiss Buttercream Icing, covered in an off-white Fondant. 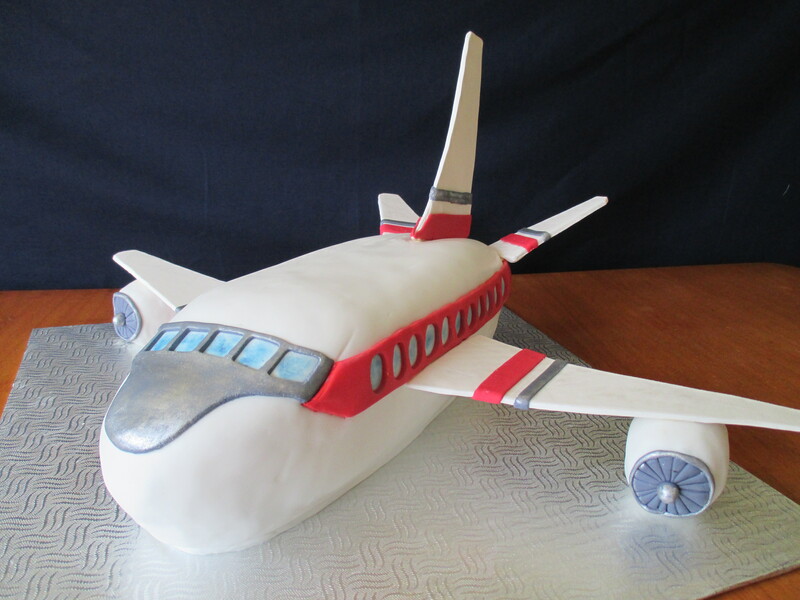 (This cake idea was from Sophie Lacourciere, via Pinterest). Playing around with different designs for some cupcakes. Ideas and possibilities are endless. Cupcakes make great favors for parties, weddings and other events, especially themed occasions. You can easily just go crazy decorating them. 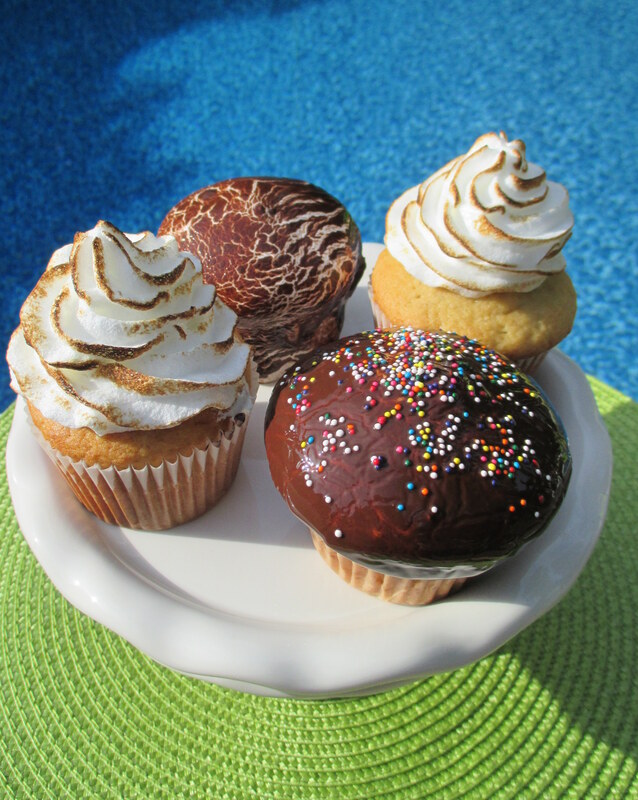 Here is a sample of some of my many cupcake designs, they are doing their best on the “Catwalk”. 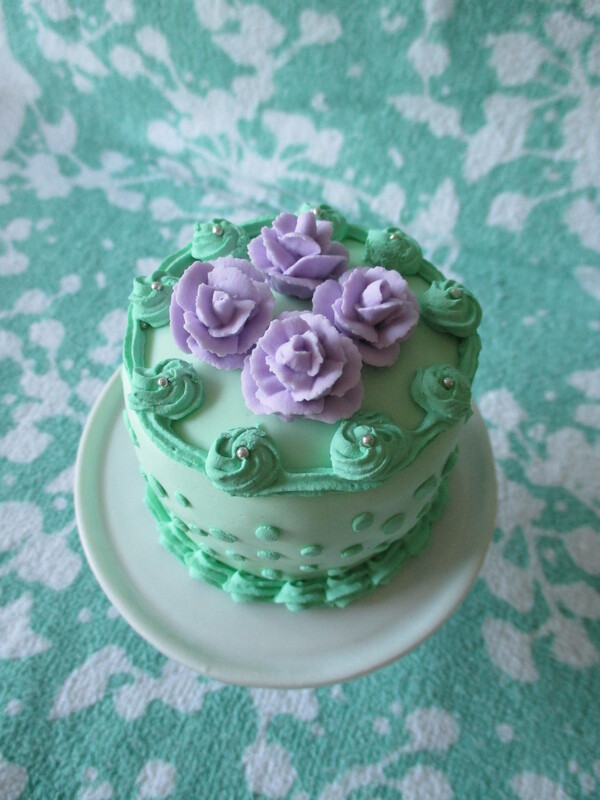 Mint Julep Cupcake with Love Me Lavender Roses. 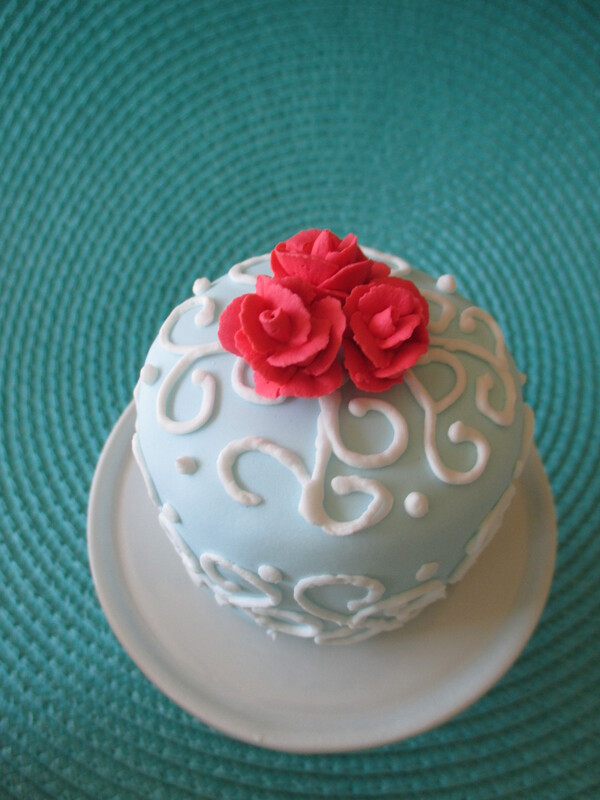 Porcelain Blue Cupcake (color) with Kiss Me (color) Roses. 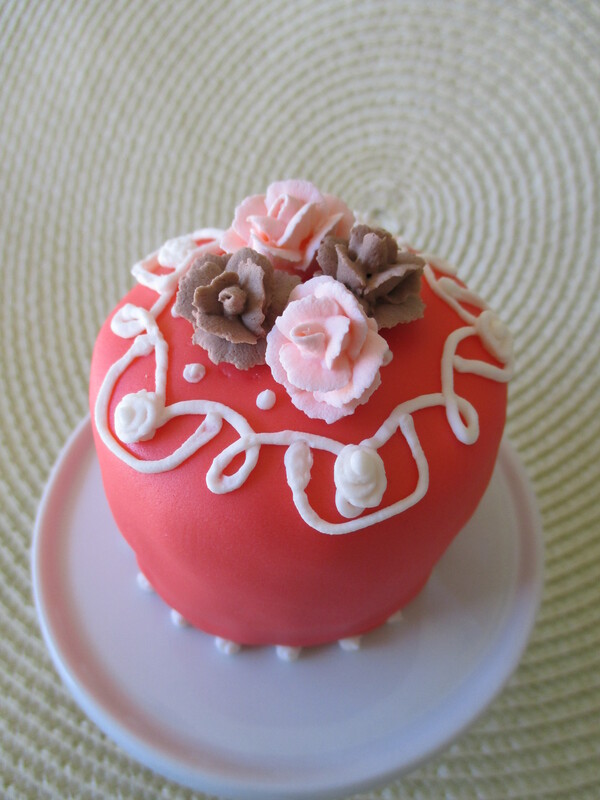 Calypso Coral Cupcake (color) with Chocolate Flavored and Peaches & Cream (color) Roses.